Rules of Golf: Wrong Putting Green - Noh! Interference by a wrong putting green occurs when a ball is on the wrong putting green. Interference to a player’s stance or the area of his intended swing is not, of itself, interference under this Rule. You can view this embarrassing episode at this PGA Tour link, which to make matters worse, shows Noh casually stamping down the large divot hole that he had made, his caddie then retrieving the divot and replacing it and subsequently, the greens staff officials arriving to properly repair the damaged area where Noh had hit from. The ensuing conversation between the Rules Official and the clueless TV commentator is almost as embarrassing as the incident itself; “Is that a Local Rule, or is it a Rule of Golf? ", asks the commentator. Where do they get these guys from? Some readers might remember a blog of mine from March 2010 (click here) where I reported on a European Tour initiative, outlined by Senior European Rules Officials, John Paramor and Andy McFee, to educate Tour players on simple rulings. They announced that if any player called on a referee to make what was considered to be a frivolous ruling, they would be given a specially produced DVD to study and also be required to attend a Rules seminar. If they failed to attend this seminar within the next three tournament weeks they could be barred from entering another event until they did. Coincidently, I emailed the European Tour only a few weeks ago asking whether this sanction had ever been effected and if so how many times? I did receive a reply, confirming that the policy was introduced some four years ago and that until recently it has acted as a deterrent with few of these rulings requests, but that they were quite willing to firstly remind the players that this policy is in force and that the Tour is ready to enforce it where necessary. Perhaps I am being too skeptical, but my interpretation of this response is that no players have ever been sanctioned under this initiative. It is a shame that Seung-Yul Noh isn’t a European Tour player, or their resolve could have been tested! 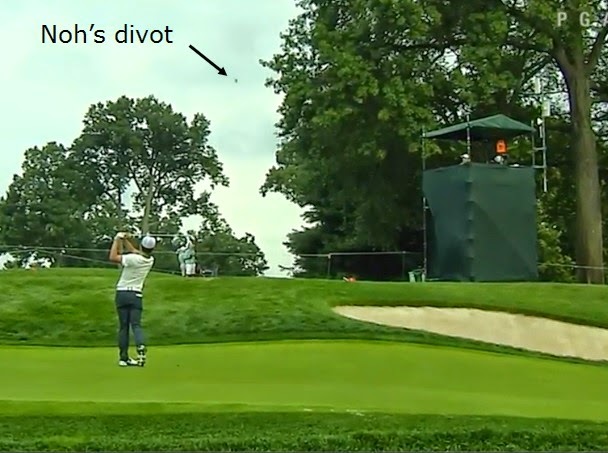 The Chella Choi infraction, at the Canadian Pacific Women’s Open, reported at this Golf Channel link (with video clip) merits a blog of its own, but I have already said enough for this week. To whet your appetite, Choi refused to accept the penalty imposed and chose to withdraw instead. It’s worth watching! If you are not already receiving my free, weekly 'Rhodes Rules School' series, please click here. I have received some wonderful testimonials from subscribers saying how much they enjoy receiving them and that they are obtaining a better understanding the Rules of Golf the easy way. Would you agree that "you can not practice puts on the front 9 when playing 18... though on the back nine its fine (if you are not delaying play) after you have completed the hole..." do you know of a ruling? Q. An 18-hole stroke-play competition is played on a 9-hole course. A competitor, having holed out at the 3rd hole, plays a practice putt on the 3rd green. Since the stipulated round requires that the competitor play the 3rd hole as the 12th hole later in the round, is the competitor penalized for practicing? A. No. Rule 7-2 permits a player between the play of two holes to practice putting or chipping on or near the putting green of the hole last played. Thank you for your very helpful and instructive web site and emails. On this subject of a ball on the wrong green, what is the rule about lifting the ball? Is it necessary to mark the ball on the green and then lift and drop the ball? Or is it sufficient to simply lift the ball without marking it and then drop where one assesses is the nearest point of relief? Linked to this, should one mark the nearest point of relief and then drop within one club length? Without having marked the ball on the wrong green, the nearest point of relief and one club length, it would be difficult to assess whether the ball comes to a rest no nearer the green. There is no requirement to place a mark, either where the ball lies on the wrong putting green or at the nearest point of relief off it. The player only incurs a penalty if they drop and play a ball from outside of the permitted area. I recommend that you check out my blog on this subject, dated 17th October 2012. My approach shot to a green spun back into a lateral water hazard. The flag was placed at the front of the green and I was long and left of the flag. I played my fourth shot under penalty from where I hit the original approach shot, but could I have taken relief from the hazard by dropping the ball 2 club lengths not nearer the hole even if this meant I was dropping the ball on the green? If there was a spot within two club-lengths of where the ball last crossed the margin of the lateral water hazard, not nearer the hole, then you may drop a ball there, even if it is on a putting green.